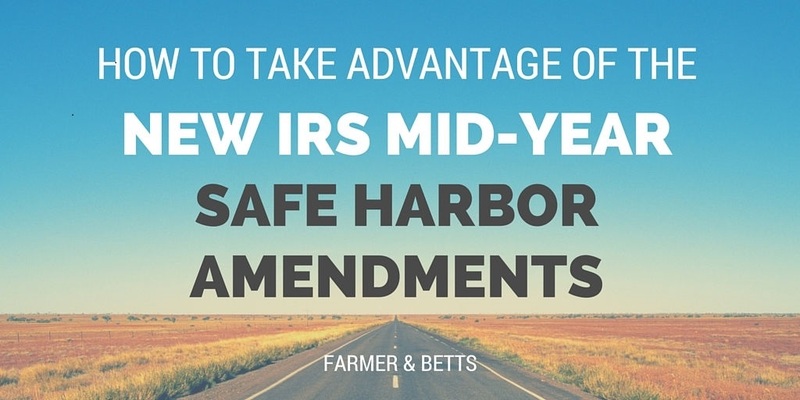 Safe Harbor Mid-Year Amendments | Farmer & Betts, Inc.
Plan sponsors now face less uncertainty and fear of losing their safe harbor status for 401(k) plans when making mid-year amendments. The IRS recently issued a notice that clarifies guidelines for making changes to safe harbor plans mid-year. IRS Notice 2016-16 answers many, but not all, of the questions concerning mid-year amendments. The rules laid out by the IRS also apply to safe harbor 403(b) plans on similar terms. In the past, plan sponsors couldn’t amend their safe harbor 401(k) plan mid-year, unless the employer was operating at an economic loss and had provided notification that they were planning to reduce or suspend their contributions. Plans will no longer lose their safe harbor status as a result of making a mid-year change as long as the change is not prohibited and the sponsor gives employees adequate notice and time to change their deferral election. If a plan sponsor would like to make a mid-year change, they must comply with two requirements. First, an updated safe harbor notice must be provided to employees covered by the plan 30 to 90 days before the change goes into effect. Second, each employee must be allowed a reasonable amount of time (at least 30 days) to change their deferral election before the change goes into effect. Change in plan year, including the adoption of a short plan year. Adoption of safe harbor plan status on or after the beginning of the plan year. Reduction or suspension of safe harbor contributions or changes from safe harbor plan status to non-safe harbor plan status. A change to increase the years of service required to receive the safe harbor contribution under the plan. A change to narrow the group of employees eligible to receive the safe harbor contributions. A change to the type of safe harbor plan (a change from traditional to QACA). A change to modify a matching contribution formula if it increases the amount of matching contributions or allows for a discretionary matching contribution formula unless it is made retroactively to the beginning of the plan year and at least 3 months prior to the end of the year. Though Notice 2016-16 provides direction for many mid-year changes, some issues are still unclear. The IRS Notice did not address mid-year amendments relating to plans involved in acquisitions and mergers. They also omitted clear guidance for changing the profit sharing formula or adding a Defined Benefit. The requirements for mid-year amendments under Notice 2016-16 are effective for mid-year changes made on or after January 29, 2016. Do you have questions about a safe harbor 401(k) plan? Contact our office today at 888-565-9887. The Farmer & Betts team offers the highest level of pension plan expertise and service, as well as an ERISA attorney on staff and an experienced compliance department. We are happy to support you with specialized plan design and competitive fees. Contact us by email or by phone at 888-565-9887 to learn more.